(NaturalNews) In the Bicol Region of the Philippines, hundreds of farmers, scientists and consumers are gathering in opposition to the commercialization of Syngenta's GM Golden Rice. Feeling as if their property is being overtaken and their food system hijacked, the farmers are rejecting their government's endorsement of Golden Rice and the agricultural system that will only indebt farmers to some faraway corporation. Believe it or not, in August 2013, more than 400 farmers and crusaders marched right up to the Department of Agriculture in Pili, Camarines Sur, and began uprooting GM Golden Rice. However, the field tests continue, and the farmers are angry as children are feed-tested the bright GM grain as if they are merely test rats in a giant, corporate experiment. According to the Golden Rice Project, which is funded by the Rockefeller Foundation, genetically modified Golden Rice is the answer to vitamin A deficiencies in rice-dependent countries like India, Vietnam, Bangladesh, Indonesia and the Philippines. Beta-carotene is naturally concentrated in the leaves of the rice, but not in the grain that people consume. Syngenta has developed prototypes of a genetically altered rice seed that can ultimately produce rice grains containing vitamin A. Two genes are inserted into the seed which restart the carotenoid-biosynthetic pathway, halting down-regulation, allowing beta-carotene to accumulate in the grains. 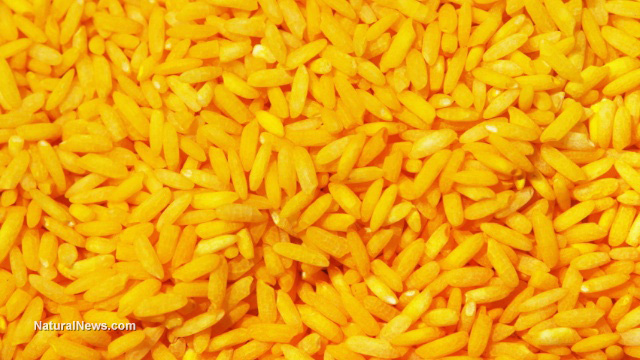 The rice crop appears golden because of the increased beta-carotene in the endosperm. Proponents of the crop feel that the vitamin-A-fortified crop could help save lives. With GM Golden Rice, the prosperity of individual farmers is funneled to a faraway corporation which owns the patent and intellectual property rights on the genetically modified seeds. This centralization of agriculture limits the ability of individual farmers to provide a diverse selection of nutritious crops to each region. "More small farmers are into greater debt because of high costs of production and dependency on modern seeds and other production inputs." He continued, "In a hectare, the average gross income of farmers in the Bicol River Basin is about P36,000 [$810 USD]. However, the cost of production reaches about P29,700 [$670 USD] for the irrigation fee, fertilizer, pesticides and machineries, labor, seeds, land rent, etc." Voicing the farmers' frustration, he said, "Now they are introducing this Golden Rice to us. We believe that this is again a ploy to further control our seeds and extract profit from farmers. We do not want Golden Rice in Bicol!" So far, field tests of the Golden Rice aren't keeping up with previous yields of indigenous white rice. The International Rice Research Institute (IRRI) and local partner PhilRice have been working in the region on plans to test-feed the Golden Rice on communities in the Philippines. They have already reported yield shortages and are beginning to discourage full-blown commercialization of the seed. The IRRI reported, "While the target level of beta-carotene in the grain was attained, average yield was unfortunately lower than that from comparable local varieties already preferred by farmers." Dr. Chito Medina, National Coordinator of farmer-scientist group MASIPAG, is concerned that GM Golden Rice will undermine a variety of more affordable sources of vitamin A, like green leafy vegetable crops, yellow fruit and the yellow sweet potato. The sweet potato alone has five times more beta-carotene per gram than Golden Rice. Dr. Medina stated: "Instead of focusing on the commercialization of Golden Rice, the government should focus more on ensuring access to food, diversifying food sources and sustainable food production to curb malnutrition. "The Department of Agriculture and Philrice should also stop following the dictates of IRRI and transnational corporations, as Golden Rice will be a tool to open up the country to many more GMOs that results to further corporate control." By respecting farmers' rights to land, seed and technology, the farmers can respond to each region's needs accordingly. By forcing one kind of crop onto farmers and controlling the entire agricultural system with it, a doomsday scenario is set up, where low yields lead regions to food rations and starvation. By centralizing agriculture, the people's access to other (more powerful) sources of nutrition is restricted. Providing access to green leafy vegetables and foods like sweet potatoes can provide a rich variety of nutrition to each region, while eliminating the perceived need for corporate control and expensive growing methods.